Calling all Bingsters! 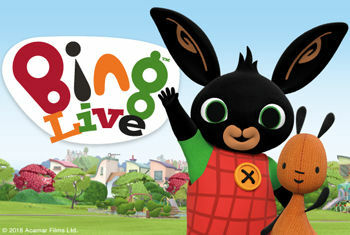 Bing and his friends are going on tour in the first ever Bing stage show. Bing Live! will visit the Alhambra Theatre, Bradford on Tuesday 10 & Wednesday 11 July as part of a major UK tour in 2018. Join Bing, Sula, Coco and Pando as they learn how to tell stories by pretending, dressing-up and singing songs. Flop and Amma are there to help, but in this magical world of make-believe things don’t always go according to plan!